Hema makes a range of maps in different sizes from the flat supermaps to the compact, folded maps. Choose the state or region you need and the style of map that best suits you. Not only popular with travellers the flat supermaps are used by businesses to mark franchise, sales and delivery boundaries. Need a map of the whole country? The Hema Australia map is available folded or flat in large, supermap and megamap sizes. If it’s the world view you’re after the Hema World is a colourful political map also available folded and in three flat sizes that can fill any wall. Hema also makes a handy map wallet for safe storage of your folded maps. 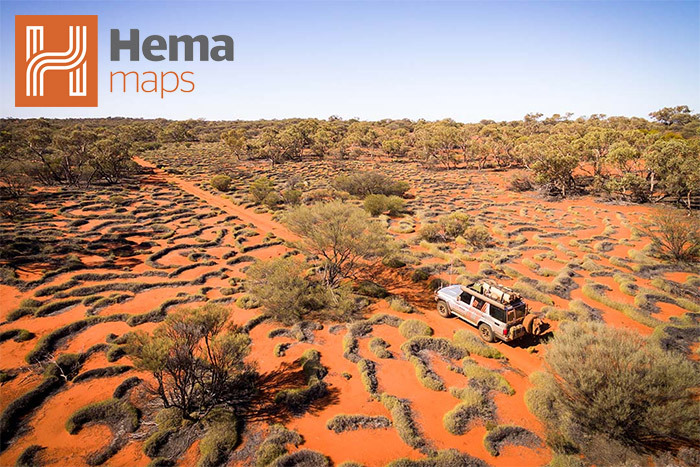 The Hema Australia Road & 4WD Atlas is in its 12th edition and has a new cartographic style making it easier to read. The atlases include information on 4WD tracks, campsites, fuel stops and thousands of points of interest to keep you busy on the road. The atlases are available in a range of sizes and bindings. Different drivers are accommodated with their own specialised maps. The Hema Australia Truckies Atlas helps professional drivers navigate all over Australia showing B-Double, road train, over dimension vehicle routes. Motorcyclists aren’t forgotten with the Hema Australia Motorcycle Atlas with 200 Top Rides for finding and planning trips using the road atlas and wall map. In 2007 Hema launched the first on and off road portable navigation system with the Hema Navigator HN1. The popular Hema Navigator HX-1 offers new 1:150,000 coverage of Australia with easy to use navigation and more than 45,000 points of interest. You can read our in-depth review of the HX-1 Navigator. We also stock all the accessories you need to keep your navigator safe with sun visors and wallets to easy to use cables and mounts. Once Australians had grown to love their Hema maps, they wanted maps for their overseas destinations. Hema has worked with top cartographic houses in the world to produce maps for Europe, Middle East, Africa, Asia, Fiji and New Zealand. Wherever you are headed, you can put your trust in the accuracy and easy to use Hema maps, atlases and navigators. If you have any questions about which product is best suited to you, don’t hesitate to contact us.